Checking out the scenery... I love birds!! Our 11 year old mini, Moses, continues to lick and bite his hindquarters even contorts to reach his middle back. There is nothing there except his doggy slobber. It is really drving me NUTS so I can only imagine what our old man is going through. We have tried switching to puppy food which we thought had worked how ever our joy only lasted about a month. ANY SUGGESTIONS will be greatly appreciated! Comments for Licking and biting his hindquarters... HELP!!! It's Ann again. Our Charlie was itching and scratching quite a bit this summer and I found a new topical spray that REALLY helped him; it's called Excel Hydrocortisone Spray and it's available on Amazon.com. At first (about 3 days) I sprayed Charlie's back twice a day and now I spray it about every other day. It has helped TREMENDOUSLY! It may be worth a try for Moses. Good luck! 11 yrs is too old for puppy food which is too rich in protein. Try a raw food diet - see my previous post "Itchy and scratchy". I get the frozen food from Petco. My mini, Muffin, developed a very itchy skin from about 9 yrs. He's now 11 and has stopped the incessant scratching. Vet sold me Stronghold which seemed to make it worse. The cure? Feed him raw food now and it's like a miracle. He's stopped the scratching, he's quieter, happier and his eyes are brighter. He thoroughly enjoys his food and wherehe wiuld have frequently had the runs (often with mucus in his poo) hus poo is now firm and not runny and no more mucus. Check out the BARF diet (Bones And Raw Food). Amazing! I use DermaBenSs shampoo on Charlie. It's gentle, soap-free and it cleans out the hair follicles. I have used several oatmeal shampoos in the past, but I think this one is better. Thank you for the input. Ann, he thinks he is still a young lil guy but this itching has slowed him down. He is the best looking mini we have owned. I will try the food options you both have suggested. I also read that maybe using tgel shampoo may give him some relief. Is this a familiar option to either you? It sounds like Moses may have developed a skin allergy. A limited ingredient dog food may help. 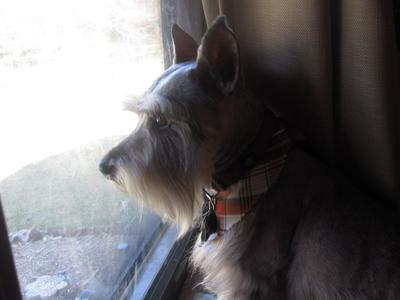 We feed our mini-schnauzer Natural Balance Sweet Potato and Fish formula. It is available at Petco, Pet Supermarket or online. Good luck! I know it's frustrating when your dog is suffering and you are not sure what may be the problem. NOTE FROM LINDA AND MAX: You might also want to try a high quality senior food for your schnauzer. It could be that the puppy diet is too rich for him and causing him to itch. A senior diet is tailored to an older dog.